Momma and Daddy's cousins from Knoxville, Tennessee, are coming to visit us at the Lake next week, our first official visitors of the year, so Momma has been using the weekend to clean things before they get here. Like hosing off the decks, stairs and walkway (they were icky with pollen), cleaning the tables and chairs and benches on the decks and washing the windows (only cleaned 12 of them … the bedroom and kitchen windows are going to wait) and that is only part of her agenda, she still has lots to do ... Daddy is out of town so he isn’t here to help her, either. Needless to say our blog and visiting with you will be taking a back seat, which we aren't happy about, but that is summertime life here, people only want to visit when it is warm ... hee hee! They aren't arriving until Tuesday, so hopefully we will be able to keep up on what is going on with you until then. And if any of you want to teleport to the Lake to visit with us when the human company is here (especially you Pepi ... Sabrina) please do, we would love kitty company! The place is looking good!! Enjoy your visitors! I hope you have a good time with your visitors! We would like to come and visit you and lie out on your lovely deck. You must get lots of fev-vers to watch too with all those trees. Have fun with your visitors. 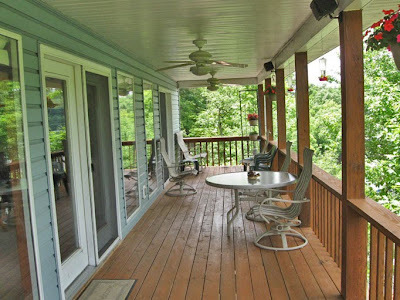 We'd love to visit you....That deck looks fabulous. What an amazing spot to spend some time! Good luck to your mom with all her cleaning and visitor-preparation! Sounds like a busy time! Enjoy your company. Maybe they'll bring you treats! 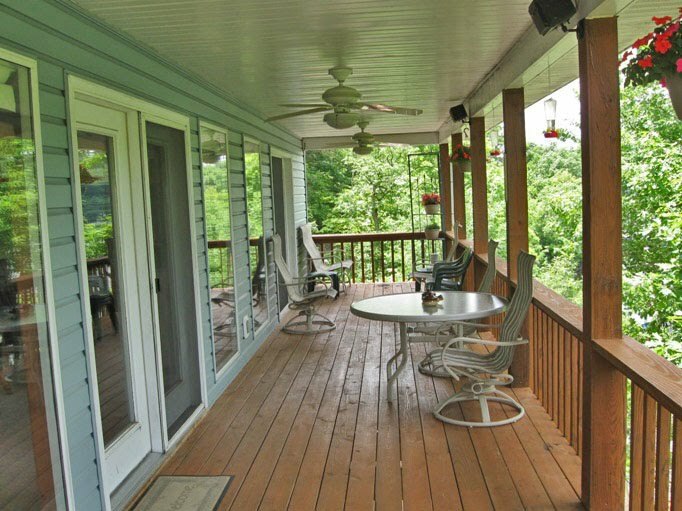 Your deck looks like the perfect place to spend an afternoon! My mom just loves the water! My mom says if I get to teleport over, she's coming too...the whole family will come! I'd be on the deck pretty much 24/7. I LOVE lakes and BIG rivers... We had cousins in from NY and OK this weekend in little ol' Iowa. It was fun! Sabrina, I would love to come visit! I will come keep you company while your momma is busy. Wow, what a beautiful deck to sit on. Dad washed down our deck a few days ago. It looks so much better. Your Mom sure did a good job getting it all spiffy for your visitors. Sure hope you have a great time with you visitors. Does the deck face the lake?? Ours faces the river and it's full now. Look at that awesome deck! How lucky you all are. I hope you enjoyed your company and your beautiful home.